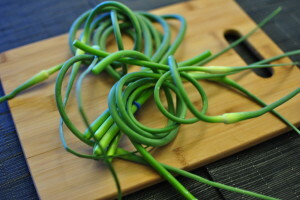 Garlic scapes are a great way to get your garlic fix before garlic bulbs are ready to harvest. Photo courtesy of Two Fat Bellies. Garlic scapes might seem baffling at first glance but they’re a great way to get your garlic fix before bulbs are ready to harvest each summer. Scapes are the flower stalk that many garlic varieties send up in the spring and early summer. If left to mature, the scape will form bulbils and seeds and flowers — although almost all garlic today can only reproduce asexually from its cloves. Most garlic farmers pluck off the scapes so that nutrients will go towards growing the bulb, with the end result being lots and lots of scapes. The good news? Scapes are delicious and can be cooked many different ways such as in the garlic scape recipes below. 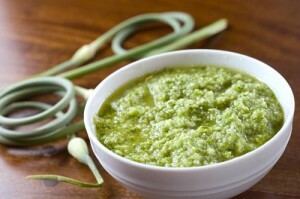 Simply substitute garlic scapes for basil or use a half and half mixture for delicious pesto. Photo courtesy of MaryCrimmins.com. Simply substitute garlic scapes for basil or use a half and half mixture of basic and scapes for delicious pesto. Pesto recipes range from the simple — blend up scapes and/or basil with olive oil in a food processor with toasted pine nuts, lemon juice, and salt and pepper — to more carefully crafted recipes using a mortar and pestle or finely mincing ingredients and stirring them together. Garlic scape pesto is perfect for pasta but can also be used in pesto chicken dishes where the pesto is slathered on chicken breasts which are then wrapped in proscuitto and then oven baked at 400 degrees for about 25-30 minutes. 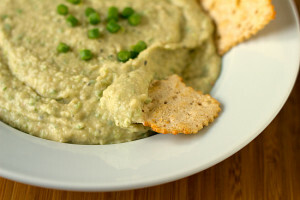 Garlic scape hummus photo courtesy of BrownEyedBaker.com. This is another great scape recipe, with the following ingredients blended up in a food processor. Blend into a thick paste and add salt, pepper, and curry to taste. You can also use different beans, as some recipes call for white beans in place of chick peas/garbanzo beans. Scape pizza photo courtesy of Honest Cooking. 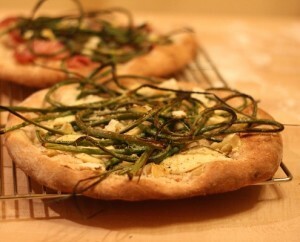 Scapes cab be chopped or thinly sliced and added to pizza as a topping similar to onions. Other scape pizza recipes call for lightly sauteing the scapes whole and then placing them on top of dough and cheese when assembling your pizza. Like all the garlic scape recipes here, there’s really no “right” or “wrong” way to cook with garlic scape recipes. 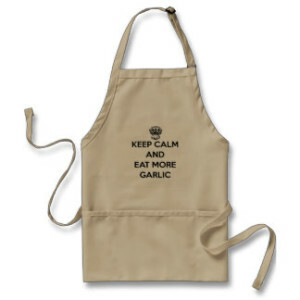 Feel free to experiment and try your own creations whenever you might otherwise use garlic or garlic powder in a dish. Garlic scapes can be prepped and sauteed just like asparagus, either as long pieces or chopped up into smaller 1-2″ pieces. Some people tie scapes together before sauteing to make them easier to maneuver in the pan while cooking. Similar to sauteed scapes, you can toss them in live oil, salt, and pepper and grill for a few minutes, flipping them once. Cook until they have a bit of char then remove, and finish with salt or lemon zest before serving. To get a little more garlic zing, simply chop raw scapes and mix them into salads like you would scallions. A simple scape butter recipe is to melt 1/4 cup of butter and mix in chopped raw scapes to taste. Thyme and other herbs can also be added, with scape butter a great addition to homemade garlic bread. Scapes can be added to many different soups that call for garlic, such as this garlic scape soup recipe. The sky is the limit here, as scapes are very versatile and can be added to many different soups or dips.